STEPCRAFT CNC SYSTEMS - A World Leader In Affordable, High-Performance, Multi-Function CNC Systems | Stepcraft, Inc.
STEPCRAFT is the only machine you will ever need. Want to start a business? Download our Free E-book! "Your Success Is our Success! Our team is dedicated to ensuring that our customers have the resources, support, and guidance to successfully turn all of their ideas into reality using a STEPCRAFT system." The World's leading multifunction desktop CNC system. Choose your size, spindle, and configure with the functionality you want and turn your ideas into reality! 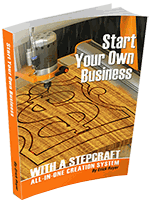 YOU CAN OWN A STEPCRAFT SYSTEM TODAY FOR LOW, EASY MONTHLY PAYMENTS. "My STEPCRAFT allowed me to realize designs that, in the past, would have required many hours of hand work. With STEPCRAFT USA service and support, I never worry about my system being down - the support is excellent, keeping my business going." "Customer service is absolutely outstanding. They have patiently been with me every step of the way as I learned. My STEPCRAFT-2/600 has paid for itself 3 times over. I use it every day milling plastics and aluminum." "STEPCRAFT is the main tool I use to bring my ideas to reality. Their support and dedication to standing behind their product has been critical to the success of my business. Thank you for enabling me to make the leap from corporate life to entrepreneur." "I love my Stepcraft. The machine is very accurate and I love the multifunction aspect of their systems. Stepcraft support is second to none."